In the age of the digital, Smart Cities uses Information and Communication Technologies (ICT) to become innovative and resource efficient providing intelligent solutions to urban problems such as transportation infrastructure (re-routing owing to traffic), human health (indoor and outdoor air quality management), and building (relaying near-realtime energy use data to owners). However, to date, there is no holistic and robust environmental accounting platform for the management of Smart Cities, its neighborhoods and buildings other than the reliance of green rating systems (e.g., LEED, Green Globes, BREEAM) that are either incomplete or operate in silos. A business-as-usual approach to manage material and energy resources of Smart Cities and all their elements is entirely inadequate to avoid the pitfalls of previous attempts at Smart City growth and development. Besides, there is a lack of holistic metrics and evaluation criteria to perform an integrated environmental accounting to assess, innovate, and shape Smart Cities. What is needed is a robust, cloud-based platform to model, simulate, and visualize sustainability performance of buildings and other infrastructure in order to produce auditable reports, sustainability strategies, and a roadmap towards integrative environmentalism of Smart Cities. Currently, under development is the dSIM platform that offers a sound solution to the problems discussed above by being integrative and collaborative using an extensible environment spanning seamlessly across a variety of scales — from city to campus-scale, and from campus to building-scale. This ability to cut across scales is what allows for this platform to achieve its ultimate goal: to model, simulate, and visualize the linkages and interplay of all elements of the urban fabric of Smart Cities. @ City scale: track materials and energy flows, and recommend optimal use of renewable and non-renewable sources with minimal environmental impact; produce auditable environmental reports and sustainability strategies toward integrative environmentalism of Smart Cities. @ Campus scale: characterize upstream and downstream life cycle impacts of campuses and neighborhoods; identity best and worst performers; identify and implement efficiency measures using reduced order models. @ Building scale: “walk into” building zones to investigate abnormal energy usages and/or system faults; conduct “what if” scenarios and data analytics of building energy components; perform energy efficiency and environmental accounting procedures from within the platform. Watch the YouTube video showing the preliminary capabilities of the Platform. Use 1080HD settings for higher clarity. 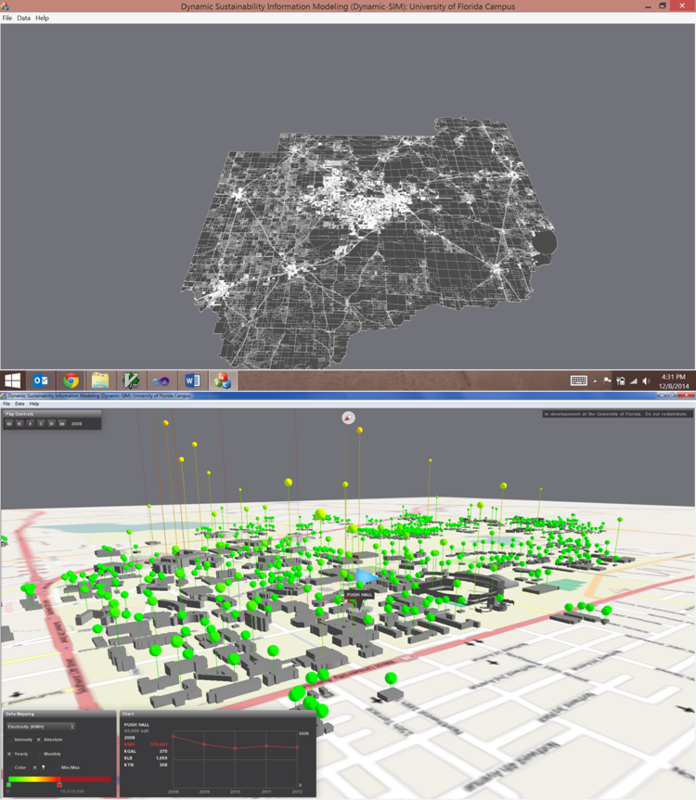 At present, although the entire Alachua County has been embedded in this Workbench, the current version maps the University of Florida campus using a three-tier approach, i.e., mapping energy use (electricity, chilled water, steam, water) at a building level over time using historical monthly data from 2008, building energy use intensities for identifying best and poor performers, and, as a test bed, seamlessly transferring into one building where users can move around the building and plot zonal real-time sensor data such as airflow speed, quantity, vane position, ambient and temperature requested. Tracking movement of building materials, energy used in the manufacturing process, etc., then, all becomes part of this larger environment. The expected outcome will have a global outreach for project design teams to conduct early design decision-making, and to operate and maintain buildings and their environment. This Workbench, under development, will pave way to include tools and techniques to assist in energy, environmental and economic analysis to realistically achieve a minimum footprint.